An understanding of international business customs can help business owners and their employees avoid simple mistakes when working with international clients. An awareness of a client’s culture shows a willingness to go the extra mile to understand their practices which demonstrates commitment to the corporate relationship. Business customs and etiquette in the US may appear to be somewhat less formal than in other countries. However, this culture of informality comes with its own set of expectations. Read on to find out how to navigate some common US business customs. Even when meeting someone for the first time, American greetings are usually quite casual. 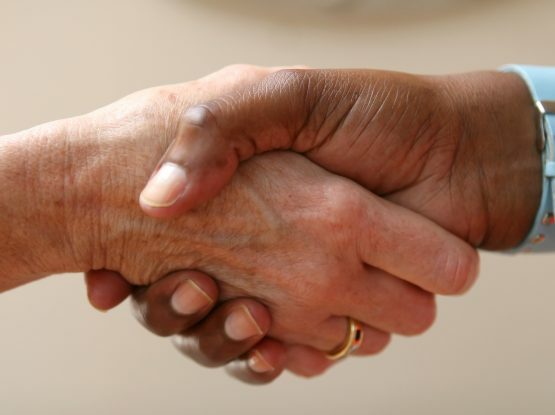 A firm handshake is customary and should be accompanied by a simple smile and eye contact. First names are often used unless the situation is very formal then you may wish to use titles and surnames as a courtesy until you are invited to use first names (this is likely to happen fairly soon). You may even be invited to call a business partner by a nickname if they have one. It is considered polite to stand up when being introduced (those who are ill, elderly, or physically unable are exempt from this rule). Business cards are exchanged in an informal manner and it is not considered rude to put someone’s card in your wallet or back pocket. Americans tend to be quite direct; they value logic and linear thinking and expect people to speak clearly and in a concise manner. This abruptness can sometimes be perceived as rude by other cultures; even within English speaking countries such as the UK. However, not “telling it like it is” is simply time wasting to an American, and time is money. Any problems should be referred to as challenges and an upbeat, positive manner will go a long way to impress. Exchange business cards (there is no formal ritual for this). Be afraid to be direct in negotiations. Complain or use negative language. Working hours in America vary from business to business but it’s not unusual for Americans to work longer than the average eight hour day. Some Americans even work longer weeks (for example, in the Military Defence they work a six day week). Americans who work longer hours often incur extended holiday time which can result in them being out of office for weeks at a time. Time is seen as a precious commodity in America and punctuality is considered to be highly important in the working environment; particularly in the Northeast and Midwest. It is seen as a sign of disrespect to be late for a meeting and people who are punctual are considered to be more reliable. Discuss office hours and holiday time with US partners to ensure efficient and convenient communications. Arrive on time for meetings, if not slightly earlier. Call ahead if you are going to be late due to unforeseen circumstances. Assume the dates of your country’s national holidays and observances are common knowledge internationally. Meetings may seem fairly relaxed in the US but they are taken quite seriously. If there is an agenda then it will be closely followed and at the end of the meeting there will be a summary of all points discussed and agreed, including any steps to be taken. If you make a presentation, keep it concise. Visual aids and statistics will be appreciated as Americans tend to be impressed by evidence and hard data. Someone who is quiet during meetings may come across as unprepared, so do try and contribute. As time is precious, business tends to be conducted quickly and without extended discussion or small talk. It is common to try and reach at least a verbal agreement at the first meeting. The emphasis is on getting a contract signed rather than initially building a relationship. The business relationship may develop over time once the first contract has been signed. Employ visual aids, such as infographics, to enhance and inform. Mumble or fidget during presentations as this can allude to disinterest. It is not uncommon for colleagues and business partners to invite each other to informal social activities. This could take place in a restaurant, a barbecue at someone’s home, or even a picnic in the park. If you are invited to someone’s home then it is customary to take a small gift, for example a box of chocolates or a bottle of wine. The guest of honour is often toasted and this should be reciprocated with a toast of thanks. If you are attending a large social event it is acceptable to arrive slightly later than the stated time. Table manners are more relaxed than in other cultures, although elbows on the table are generally unacceptable. It is considered good manners to stand until you are invited to sit and to only begin eating when the host/ess does. When going out to dinner, the person who has organised the outing usually settles the bill, regardless of gender or position within the company. Don’t be afraid to decline an invitation if you have other plans. It will offend more if you accept and then don’t attend. Place your napkin on your lap when sitting down to dine. Feel free to politely refuse any food. Offer food or drink to others before serving yourself. Leave in a timely manner (for example, if an invitation reads 8pm – 10pm, avoid staying any later than 10pm). Start eating until everyone has been served and the hosts have begun. Rest your elbows upon the dinner table. Sit for dinner until invited to. Jelly has a wealth of expertise when it comes to managing business partnerships, both local and international. With a number of high profile clients and connections, Jelly knows exactly what it takes to form meaningful relationships between industry members, key influencers, and potential partners. Contact us at hello@jellymedia.com to find out more.